Diamond is one of the two best known forms of carbon, whose hardness and high dispersion of light make it useful for industrial applications and fabulous jewelry. Diamonds are specifically renowned as a mineral with superlative physical qualities â€” they make excellent abrasives because they can be scratched only by other diamonds and some other extremely hard items. As a result of this hardness and durability, they polish very well and can retain their luster extremely well...making them a prized gemstone and one of the most popular for jewelry. It is estimated that there are 130 million diamond carats (26,000 kg) mined annually. As for the fake or synthesized carats, that amount almost quadruples to approximately 100,000 kg per year. Diamonds are rated based on clarity, colour, cut and carat size. The 4 C's of diamonds: The 4 C's for diamond rating are: Clarity, Color, Cut, and Carat Weight. Clarity is a measure of how clear or pure a diamond is. The number, size, nature and location of both the internal and external imperfections is used to determine clarity. The GIA - Gemological Institute of America has established a scale for rating clarity. Please note that this scale has evolved over time and will continue to do so as improvements in verification of diamond clarity are made. 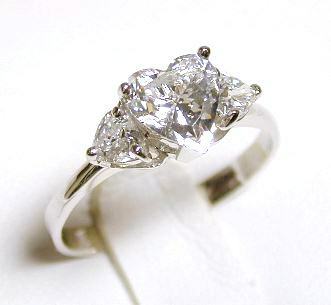 Also of note: Be vigilant in purchasing clarity corrected diamonds as the methods used are not necessarily permanent. Cut refers to the proportions, finish, symmetry, and polish of the diamond. These factors determine the fire and brilliance of a diamond. The more accurate the cut, the better quality the diamond will have and hence, it will sell for a premium price as compared to poorly cut diamonds which should sell for a discounted rate. There is now a computerized system, the Dia-Mension system, which can easily measure the exact proportions of any diamond. This allows for a quick determination of the cut quality of the diamond. This is the only measure of diamonds which is in the hands of the cutter craftsperson or artist. He or she will be responsible for the cut quality whereas all of the other measures are purely natural. Carat measures the weight of a diamond. Carats are subdivided into a 100 points system ( 0.01 carat = l point ). One carat is equal to 0.20 grams. The larger the carat weight of a diamond, the greater its value/carat. For example, a 3-carat diamond is worth more than 3 1-carat diamonds.